Wanting to invest more this year? Don’t know where to start or what to do? Stop trying to time the market and start investing automatically each paycheck. You can set it up through a discount brokerage like Scottrade, or you can do it yourself, but it just takes a slight bit more work. 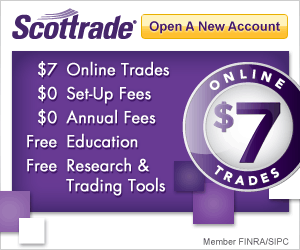 With Scottrade, you can invest a little each month automatically for the super-cheap rate of just $4 per trade. You can invest in over 7,000 different investments – but you can also just keep it simple and stick to index funds as well! I recommend Scottrade because it makes automatic investing easy, but anyone can set it up. To start, you need to open an account at a discount brokerage. If you already have one, great! Once you find your account, you need to locate your account’s Routing Number and Account Number, just like you would for a checking account. Every account has one, but it can be difficult to locate. When deciding how much to invest, remember to think about your goals and how many paychecks you get each year. Now, think about why you are investing? Is it for your Roth, well then look at how much it will take to max out your retirement savings, and then divide by your number of paychecks. So, you can invest a maximum of $5,000 per year, and you get paid bi-weekly, you need to invest $192.30 per paycheck (5,000 / 26 = 192.30). Now that you’ve decided your amount, and setup your direct deposit, you are almost done. The final step is to setup the automatic investing at your brokerage. This is where you choose what to buy and how often. I recommend setting up a buy the Wednesday following your deposit. So, if you were paid bi-weekly on the first and third Friday of the month, the actual investment would “buy” on the second and fourth Wednesday of the month. I choose Wednesdays because it avoids paycheck and market holidays for the most part. Since you are keeping it automated, I suggest you check out my College Student’s Guide to Investing, which highlights several index funds for the long term. By focusing on index funds for the long term, you keep expenses minimal while staying right in line with the market. And with automatic investing, you will dollar-cost average into the market over time, which should balance any market losses with market gains. Finally, make sure that you reinvest your dividends. This is the final automation step, and it will help your money grow over time. Readers, do you automate your investing? If not, have you ever thought about it? I have my savings automated, but haven’t done that with investing. Automating investing is a great idea; I should look into doing that this year. It takes all of the work out of it, and most people don’t usually miss the money from their paychecks when they get used to the lower take home amount. It’s the part about not missing it that always astounds me – if you make it automatic, people do it. If you don’t, people don’t do it! My investing is automatic because I made it a priority. I automate my 401k contribution, but I invest manually in my taxed account. Sharebuilder sounds like a great plan, I will have to check them out. I tried out Sharebuilder in the past (and still have some stock invested through them) but prefer Zecco. Their automatic investment feature IS very nice though. That’s a handy thing for many reasons. Zecco is nice, but Sharebuilder is the easiest automatic investment place I’ve found. All of my investments are automated. 40(k), IRA, Home buying fund (a bond fund) and regular stock funds in Fidelity. Every month fixed amount of money goes in to these accounts. Every quarter I take a stock of fund performance and reallocate if required. This is the best option for your time. With that fixed amount – is it automatically withdrawn from your paycheck, or do you just deposit a set amount manually? I love my sharebuilder account they have a lot of promotions! Never thought about automatic investing until now! Sounds like a good idea to help maximize the fortune of my future. Good read. Thanks.